This past year for me has been a rollercoaster of emotions, physical accomplishments, and mental stress. I have experienced some of my life’s highest highs and close to my lowest lows. Like a red point in climbing I know what I am supposed to do, I’ve rehearsed the movements, I’ve dreamt and visualized my success and honestly I can taste it, but like what often happens when pushing yourself at the limit, I have taken my fair share of whippers this year. I’ve experienced some of my proudest accomplishments and practiced rolling with failure. With these failures I adjust, learn and try to grow so next send I’ll be that much more ready. Anything worth doing is hard and other clichés aside, this is more about motivation and learning because more than anything that is what I am taking away from this year. 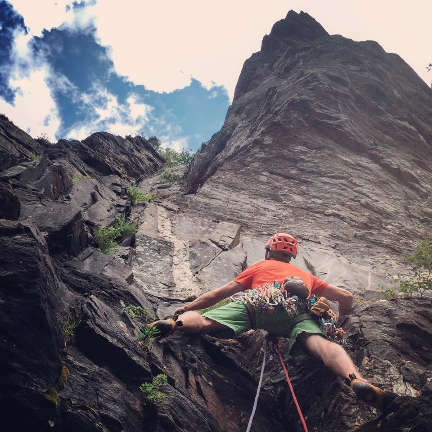 It all started a little over a year ago and I was reinvigorated in my own personal climbing and skiing, I had bold ambitions for my continuing guide education and was looking forward to growing my business and expanding offerings. All very exciting things, and it doesn’t get lost on me that I am extremely fortunate to be able to pursue these dreams. I had new projects and mentally I was in a new place. I was training, feeling noticeable gains, and getting mentally stoked more than ever. 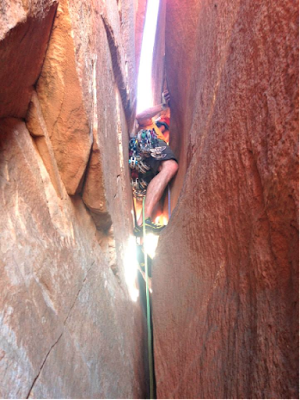 I found success on routes that have dogged me for years and at the peak of feeling good I jumped right into the AMGA Rock Guide Exam. This exam, while I did pass successfully, taught me a lot about managing stress and dropping any notion of perfection in the mountains. Even on your redpoint things hardly ever go planned, sections that once were casual give you pause, cruxes are unlocked with new beta. I cannot explain the level of stress put on guides during these exams, but for better or worse guides who successfully complete an exam are for sure at the top of the mental and physical game. The exam for most is many times more stressful than a “typical” day guiding because of challenge of routes, speed of guides and examiners acting as “clients,” and just overall being observed and feeling under the microscope. A typical day with clients I often feel is more viscous and fluid and lacks confining structure. Teachable moments happen organically, time plans often are flexible, and expectations kept reasonable. Most importantly when things don’t happen exactly to plan (which by the way is a very common occurrence in the mountain) regular clients don’t take notice, and we as guides often let it roll off our backs, error correct and continue without anyone the wiser. In exams however this is where being mentally tough and having the ability to compartmentalize successes and failures becomes hugely necessary. 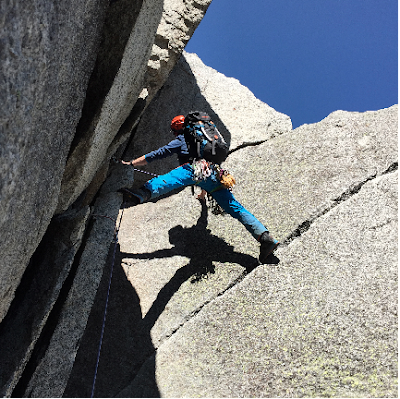 During exams or guiding I do not believe that clients or the AMGA expect perfection, but the ability to show appropriate strength as needed, as well as a large tool box to fix the problem is a must. Over the exam I learned a ton, climbed some of awesome routes (in fact a new favorite called “Risky Buisness 10.c R”) and had much success and learned even more from my mistakes. 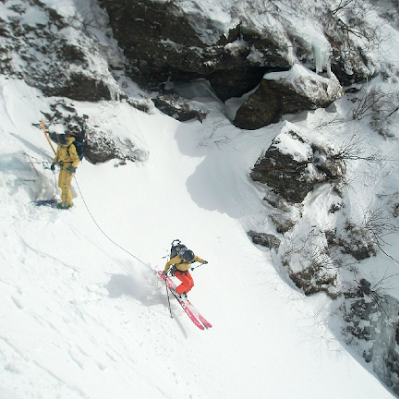 Just like with avalanche accidents, exam “marginals” can hardly be tied to a single “mistake;” it is usually a compounding of little errors that lead to the problem. Bad beta, bad luck, missing or misread information or the mountains just being unforgiving wild places can all lead to problems and hamper success. When the wheels do fall off the bus how do you react? During that first exam I learned that you can make mistakes, but don’t let them compound on top of one another. Pause, take a breath, make a plan and execute. Even with this mentality things don’t always go perfect. Coming down Epinephrine/Ancient Futures after climbing Texanephrine 5.10d I had beta that a 60 meter rope would reach a rappel station allowing me to “skip” a rappel station and avoid other groups on the popular route. Unfortunately the reality was rope ends dangling four plus feet short. With friends or a trusted climbing partner shenanigans might have ensued with cordalettes, down climbing, or other knuckle-headed ideas, but not during an exam! I swore at myself, but rolled with it and prepared to ascend. I climbing the rope as fast as I could, but no matter how fast you think you can climb it is slow and doubt starts to creep in along with the adrenaline. By the time I got to a suitable anchor my mind and body were already going a million miles an hour. Instead of prepping the hanging belay with new cord and rings, I built an anchor and brought them into me in the name of getting them moving, and dealt with all that after the fact at a rather uncomfortable belay. Now in the grand scheme of things we got to the same goal while mainlining a relatively high standard of safety, but there are many ways we can improve by learning from these mistakes and bettering our knowledge for next time. Ski Mountaineering in Smuggler's Notch with Andrea. Hidden Gully is an Ice Climb most seasons! 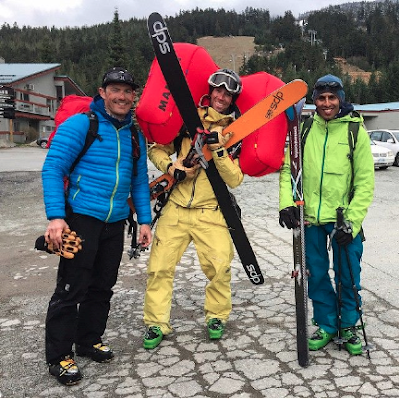 I arrived home from the rock exam to early snow and some of the best early season backcountry I can remember, and it only got better as the season progressed. While my friends in the West were dealt a lean, drought-stricken season, we in the East had an amazing season. We climbing and skied lines that don’t come in but once every few years. Ice climbs filled in with enough snow to become ski descents. It was amazing to say the least. Before long I was off to another exam and put myself back onto the burner. I arrived in Whistler/Pemberton British Columbia to one of the leanest seasons in their storied history. There was no snow below 1800 meters, requiring long mud walks, down riding lifts or my personal favorite- utilizing the heli. The snow at mid mountain was refrozen mush littered with underbrush, rock and logs (as a East coaster I was right at home) and the alpine snow pack had several active persistent weak layers. That, and it wouldn’t stop storming, which meant snow and blowing winds at the peaks and rain at the trailheads. Once again the exam was a success. Overall I was more prepared, mentally ready and took all of the challenges with a breath, pause and moved forward, celebrating when things went well and maximized learning opportunities when they did not. This exam was the most fun I had on any AMGA program. Challenging conditions, objectives and strong crew made the days fly by. I was at the high point of my year. Hospital, not much to say other than my dislike of NG tubes. Then I broke the key hold of my redpoint. I returned home and whether through the joys of airline travel, physical exhaustion, climbing gym critters, I came down with strep throat. The course of antibiotics I was put on is suspected to have triggered a possible bacterial overgrowth in my small bowl, which caused a small bowl obstruction complicated by possibly linking the problem to newly diagnosed Crohn’s disease. 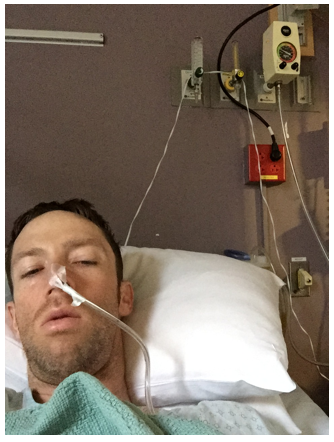 I ended up in the hospital for over three weeks. I had a cameras jammed in unmentionable places, more tubes stuck in me than a car engine, not to mention all the x-rays, CT scans, and more needles jabbed into me than I could count. I was now at the lowest of lows. I did avoid surgery but was told to adjust to my new normal. No more trips to exotic places, climbing and skiing would have to be limited, and to not expect to be strong as I just was possibly ever again. I went from feeling stronger and better than ever to being “sick”. The hardest part is everyone around you changes the way they treat you. You no longer are your old self, but the sick guy who needs to grieve and come to cope with this new reality. I was told no, can’t and shouldn’t more in the time than I had heard my whole life. I canceled a ski trip to South America, I stopped climbing and I watch in horror as the world kept moving on through Facebook and news feeds and screen time over field time. I experienced a whole new level of FOMO (fear of missing out). The guiding community is great and people did offer encouragement and soon I started to plan for the future, but unlike what I was told by doctors, right or wrong I decided to jump back into my life. I had long time clients that wanted to do a week-long trip so I explained my condition, set reasonable expectations and contingencies and returned to guiding. One trip down, my new normal was weak from a month in bed but successful. 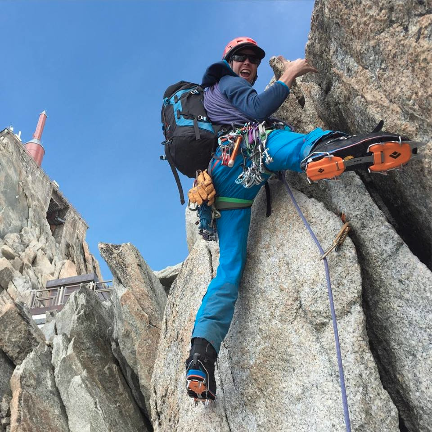 Without training once again, and against the doctors’ recommendations, my wife Andrea and I jumped on a plane and headed to Chamonix for a climbing vacation/training for an upcoming final exam towards my IFMGA/AMGA completion. Chamonix is by far the most impressive, awe inspiring, and scary place I have ever been! Never has a place nourished my soul as much- the history, the respect of guiding and a community that lives, sleeps and breathes alpinism. I needed all of it. Every morning we would wake, sip espresso and nibble on croissants knowing in a short cable car ride we would be whisked into the high alpine and thrown at some of the world’s most iconic routes. I would write more but the pictures speak volumes. 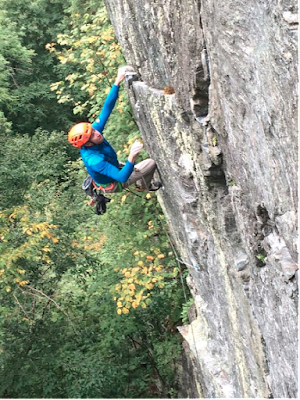 Crux of the Frendo Spur, probably my favorite send of the year! We had eight hours to make it bin to bin, and we completed the climb in 7 hours and 59 min, loading the Aiguille du Midi still tied together, crampons in hand. Returning home with even more respect for guiding and alpinism as a lifestyle, I climbed throughout New England with clients old and new. I started running and preparing for the upcoming Alpine Exam, and everything was looking like the cruxes had been solved and it was just an endurance race to the finish. But, I then finished a course of meds and my symptoms returned. Every morning I would wake up, feel great and be stoked, but with every meal I would get more and more uncomfortable. Pain, constant rumbling and bloating would keep me up so I wouldn’t sleep until the wee hours in the morning. Even with these new complications I was maintaining strength and decided to muscle through my final exam. No excuses, but you can probably guess the out come of this exam. I did my best, but sometimes your best is not good enough. I was able to physically keep up with the demands of the exam, but mentally I was defeated before it even began. The day before, between nerves, travel diets, and travel stress I found myself looking for an exit. I thought about activating my travel insurance and heading home, but I didn’t want to go out like that without even trying. I went back into the mindset of exam mode, by this time I understood what exams are like and prepared to play the game. While in the mountains I focused on the things I could control, tried to guide how I would with real clients and minimize the bumble factor. Being from the Northeast, alpine guiding, especially on glaciers, is the discipline I have the least amount of experience with and even I acknowledged my deficiencies and often tried to compensate by being overly conservative. I tried to slow down, error correct and not let my “mistakes” speed my thought process, but it’s hard to know what you don’t know. Onsite guiding in a discipline that is not your strongest while under the microscope was a tough go. In the end I did not fail any category, but did receive too many “marginals” to pass my exam. Marginals are hard because in hindsight they are all really easy to fix and are not always immediately life threading, often it is speed and efficiency that would increase client care and reward. If I had a time machine I could go back and change simple things and the entire outcome could have been different. It took a few weeks to mentally recover from this blow- there even was a brief moment when I thought I might be done with the AMGA and stick to skiing and climbing, which is what I am passionate about anyway, but I started to internalize what I actually learned from the exam. Exams are hard, they are not always fun, and the men and women who complete these exams are elite. They deserve a PhD in guiding. Doctors don’t just change specialties either without new classes, conferences internships and mentorship. As a business owner it hard to ask for help, but luckily the IFMGA community has been really great offering not only their own stories of struggles through the process but helping by offering mentorship as well. This is, after all, part of my process in the AMGA and in the long run make me a better guide for my clients and climbing partners. I do not have my health woes completely sorted and surgery might be in my future but as soon as I get a handle on that, who wants to join me on some glaciers in the North West, Alaska, South America or Italy? I would love to bring you along on my process and share some amazing adventures with you. Down but not out, I found a new nubbin to stand on- the crux is not over yet, but I am unlocking the sequence. Enjoyed your honest, positive, reflective approach Steve. Keep on rockin'! Awesome write up Steve, its an incredibly inspiring story and I look forward to reading more of your writing! Being humble is one of the most important aspects about being a climber and guide and I think you have articulated it very well through your writing here.